Bookkeeping Of Course ! 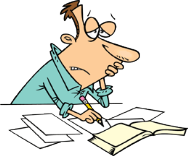 Five free Bookkeeping Tutorials explain and illustrate what's involved in "keeping the books". While accounting and bookkeeping software have made the task of recording and summarizing financial information easier and faster, it's still good to know what's actually being done "behind the scenes" by the software. These five tutorials do not teach bookkeeping; but, rather explain and illustrate what's involved in bookkeeping using the "ole fashion" manual bookkeeping sytem and procedures. These same tasks are now commonly performed using computers and accounting software; but, bookkeepers still need to know how a manual system works in order to properly use accounting and bookkeeping software. Is the Site Really Free ? Free means Free. Unlike many other sites, there is no paid membership area. So exactly who can benefit from my free bookkeeping courses ? Almost anyone associated with business wanting to learn about bookkeeping and yes you can teach an ole dog new tricks. Like explaing what makes a car run (the engne), this course is designed to show you what makes bookkeeping "run". The accounting course is made up of an Introduction to Bookkeeping Video along with four videos that explain basic accounting and bookkeeping concepts and the accompanying PDF Versions that you can download and follow along with the bookkeeping videos. So, you want to know about Bookkeeping ! Topics covered include accounting and bookkeeping terms, the accounting equation, double entry bookkeeping, debits and credits, business transactions, general ledger and journals, financial statements, and more. My Main Bookkeeping Training Site, Bean Counter, also provides additional bookkeeping courses, tests, and games. What Do You Know About Accounting Terminology ? What's an asset ? What's a liability ? What's equity ? What's revenue ? What's an expense ? What's a balance sheet ? What's an income statement ? Need additional Accounting Help ? Check out my sister site Free Bookkeeping Help. I've tried to provide you with a site that provides you with links to some excellent free accounting and bookkeeping training. Keep your business going in the right direction ! Take a moment and check if any of these services or products might help solve any of your problems.